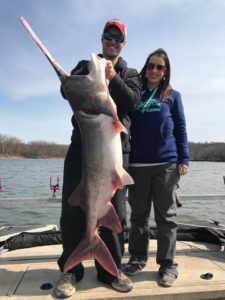 Oklahoma Fishing Report: Spring fishing is about to break wide open with the warm weather we are having! White Bass are stretched out from the main lake all the way up our rivers right now in preparation to spawn. Our water temps are in the low to high 50’s, almost right for them to begin spawning. 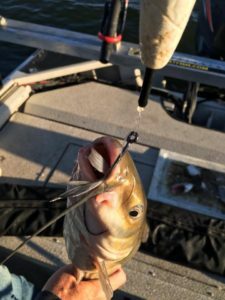 We use a jig head and GoGo Minnows or Crappie Kickers from FLE FLY Fishing Tackle when targeting white bass during the spawn. You’ll need to have a mixture of colors and sizes to figure out what they are wanting. Some days they’ll be on the creek and river banks, other days they’ll be roaming in the middle. One pattern on a tough day we used when boat traffic got high and the fish were finicky was fishing the mud edge. Boat wakes were creating a mud line just out from the bank and the white bass were hanging right at the edge of the mud line. Vary your retrieve and let the fish tell you what they want. We usually throw two lures tied on a dropper loop. 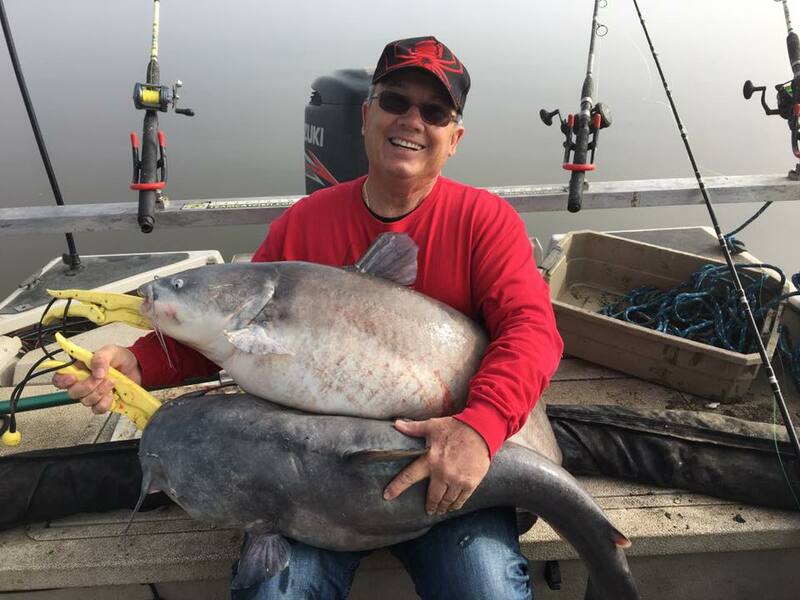 Blue Catfish are spread out at all depths right now just like our bait is. We have began catching them on shallow points and flats when the wind is high. We have been catching fish 1.5 feet deep and 40 feet deep in the same day. Deep channel edges around broken up bait is also another pattern that has been working well. Anchor fishing using fresh shad has been working best. 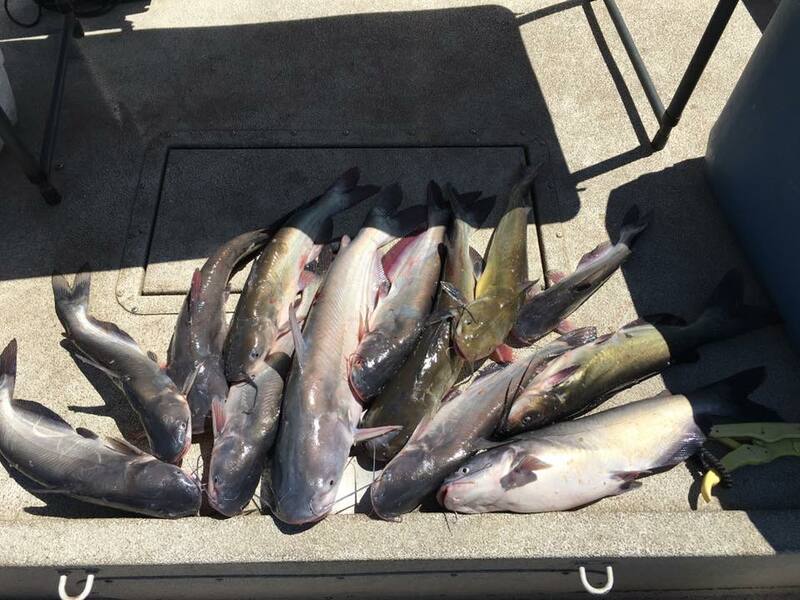 We use a float rig with a 3 ounce weight and 8/0 Double Action hook from Team CatfishTackle. 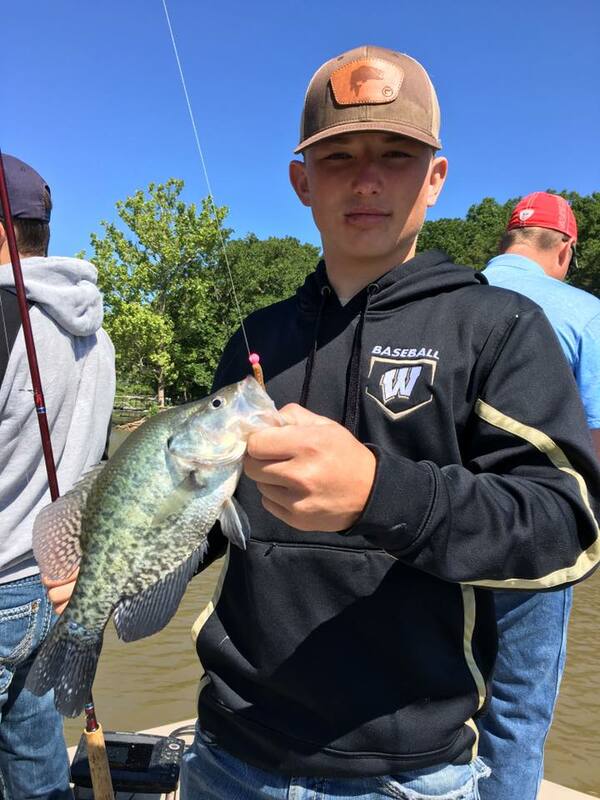 Crappie are migrating and feeding heavily on shad schools in preparation for the spawn, which is justaround the corner. 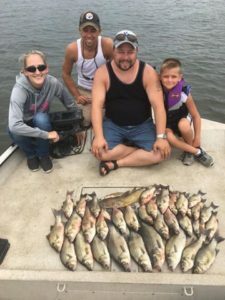 But the pattern has been changing day to day, one day we will catch fish up on the bank in 2 to 4 feet of water, and the next day catch them schooled up suspended over 30 to 40 feet of water. 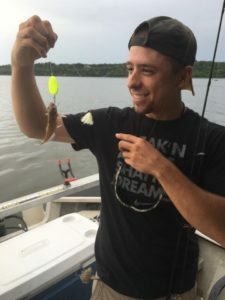 Casting out FLE FLY Fishing Tackle GoGo Minnows in the middle of coves or ledges around bait has worked well, as well as vertical jigging the same fish with the Crappie Kickers. We are using our Lowrance electronics to target shad schools with crappie hanging out behind them feeding. 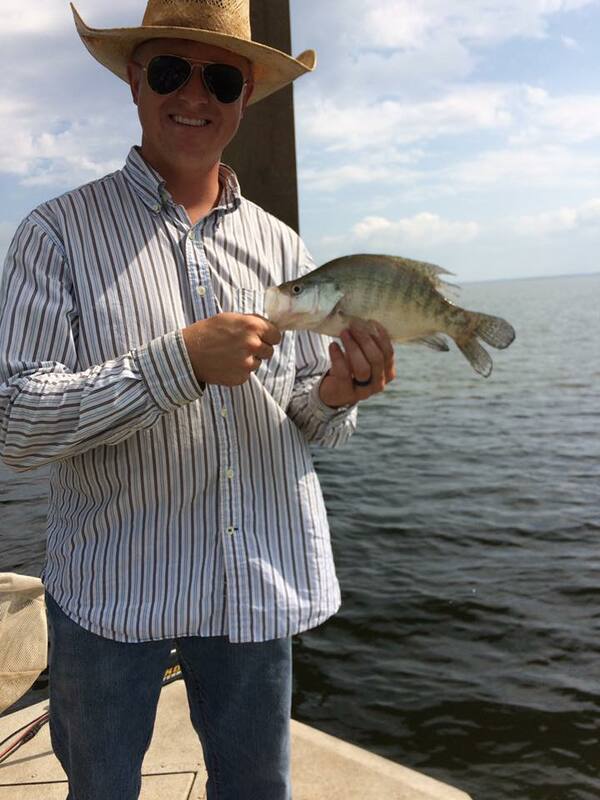 You can also, target docks and brush to catch a few using CrappieKickers or hair jigs. Don’t be afraid to step up the size of your baits this time of year. 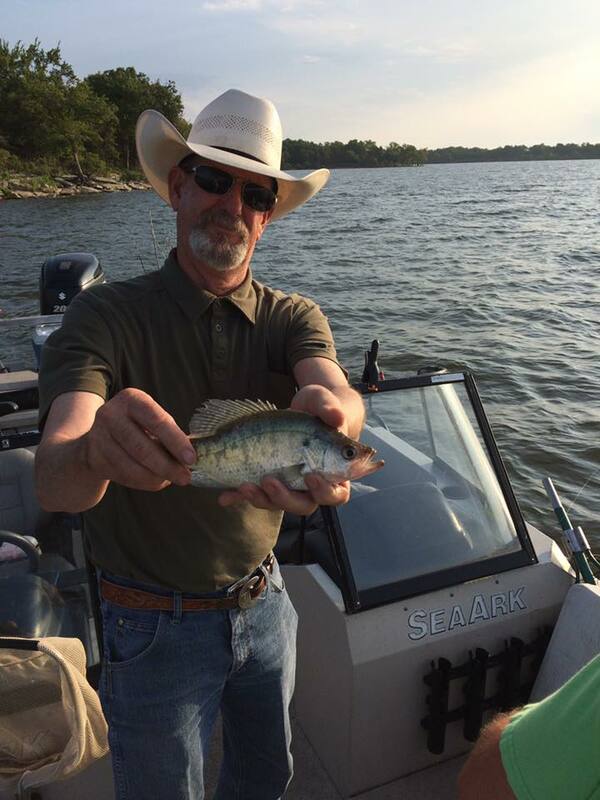 This weekend, a 3″ Buster Brown Crappie Kicker was by far the best bait for crappie and white bass. Spoonbill / Paddlefish are making their yearly migration towards and into the rivers to spawn. If we get flow that will really increase their migration with our warm water temps. We’ve caught them this week best in 15-35ft of water. If you’re interested in booking a trip, message us, or call/text 918-607-7357. Be sure and “Like” our Facebook page to get up to date fishing reports. I will be attempting go back and write detailed reports from all trips, but this summer was crazy busy and I’m now extremely behind. This weekends fishing trips were catching Grand Lake catfish. 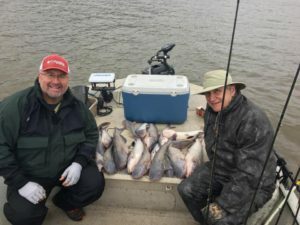 Saturday’s trip was an evening trip with our good friends from Burn Co Barbecue in search of big catfish on Grand Lake in Oklahoma. My wife and I put the boat in the water to catch bait a little after lunch time. I threw the net about a dozen times catching some really nice sized gizzard shad to feed Mr. Whiskers. We then went to a couple of rock piles (humps) to catch a few drum for bait. It took us about an hour to catch a half dozen decent drum on slabs. Then it was time to graph out a few areas and see what the catfish were doing. 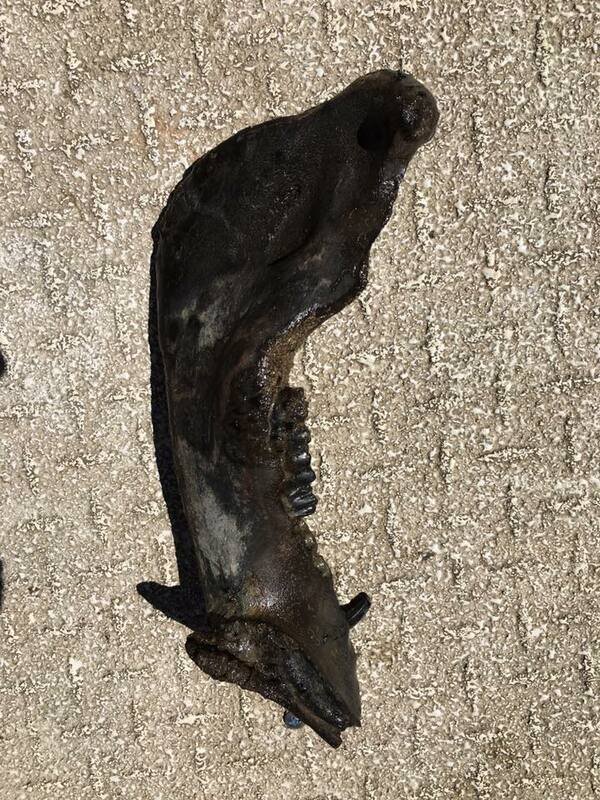 What we found was bait at all depths and scattered catfish at all depths also…not looking good. At least we had a good wind, unfortunately, it was a north wind bringing a major August cold front. Low of 54 tonight, which is really low for August in Oklahoma. We picked out crew up at 5pm and headed to our first area to drag baits. I marked the area a little and found fish and bait holding 25-35 ft deep. We got set up and the first hour we boated about a dozen good eating sized catfish and missed more than we’d like to admit. About 6:30pm the bite just stopped. I moved us to go a little shallow where the wind was blowing in and that was a mistake I made. It took me about half an hour on that pattern and only catching a couple of fish to realize what had happened. A light bulb went off and I quickly reeled up heading to deeper water. With the barometer changing drastically with the cool breeze kicking in the fish had moved out to 45-60ft deep and we were back to catching fish again. We didn’t get anything big, but had a great time and caught a box full of good eating blue and channel catfish. Looking forward to our next trip in a few weeks. Sunday, we woke up to cool temps and a slight breeze. We met our group at the ramp and got going at 6:30am. 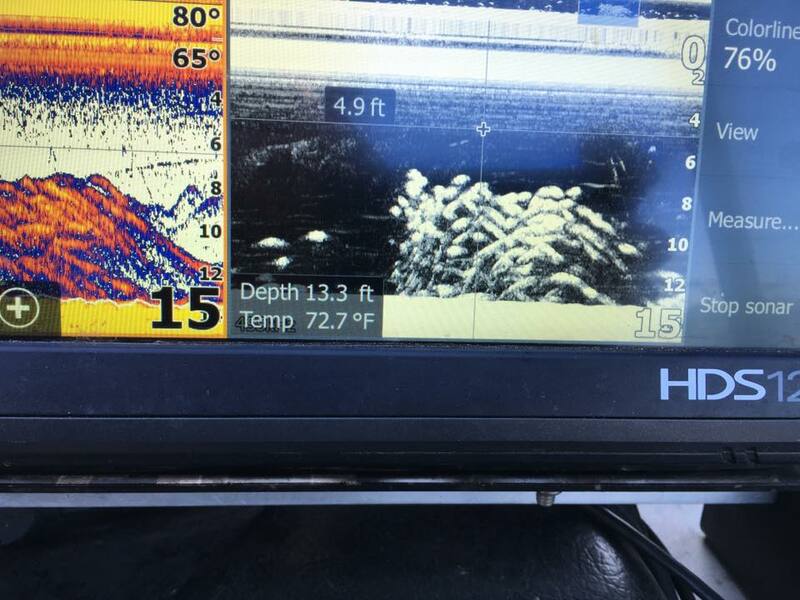 Our first area we decided to look at had scattered fish from 20-55ft deep. See a theme here for the weekend??? Scattered fish. We set up our first path for dragging baits and immediately were in the fish. We caught half a dozen at the deeper depths and missed an unreal number of short strikes. It starts looking like it’s going to be a light bite day for sure. We moved areas and the wind completely died. FYI, if the wind lays and the water becomes flat so does the bite. For the next several hours we did our very best to entice the scattered, now suspended fish, to bite with only a few to put int he box. About 11am with a couple hours left in the trip we made a long drive to a different area. Luckily, the wind picked up and put a ripple on the water and the bite picked up some. This one last drift, we caught another half dozen fish in 12-61ft of water. Now that’s scattered fish!!! 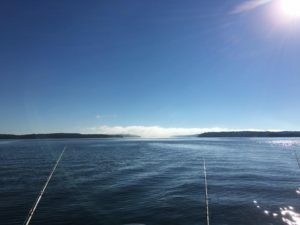 Great times and beautiful weather on Grand Lake this weekend…I look forward to more concentrated fish as the water cools for the fall/winter feed!!! 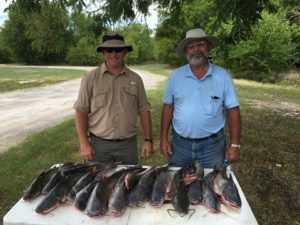 Oologah Lake Blue Catfish with new customers, Terrel and Alan, from west Texas. 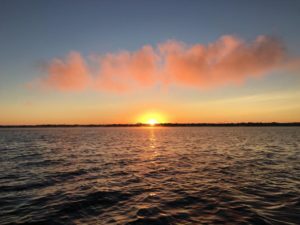 We started the morning off dragging baits across shallow windblown flats near deep water. 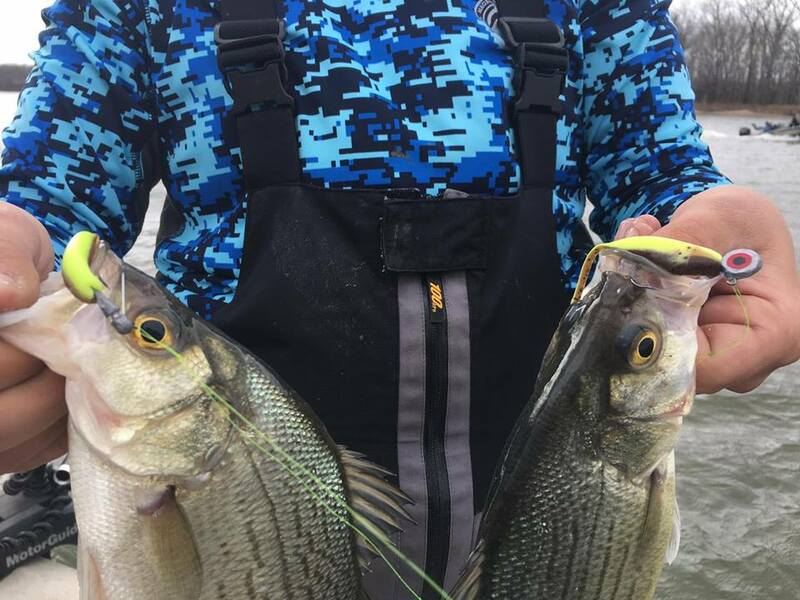 The white bass and blue catfish have been feeding heavily on this pattern for several weeks when the wind is blowing right and today we had the right wind. For anyone that hasn’t drift fished for blue catfish, the bite can be easy to hook…and difficult depending on their mood. Let’s just say today was more difficult than easy. The fish were nibbling more than anything which makes it hard to hook the fish. The one’s that bite hard were few and far between. These did great and quickly learned how to get a hook in the finicky fish. Lots of laughs and good times were had filling the cooler with good eating Oologah catfish. We used a variety of baits today with all of them working. 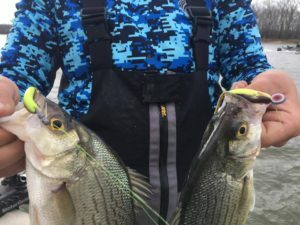 I think if we could have gotten away with using smaller baits today we would have caught a few more, but the smaller baits get pecked off quickly by the feeding white bass. Most of our fish were caught in 10-20ft of water, but we did venture out to a 40ft flat and caught a couple. Looking forward to having you guys again next weekend!!! 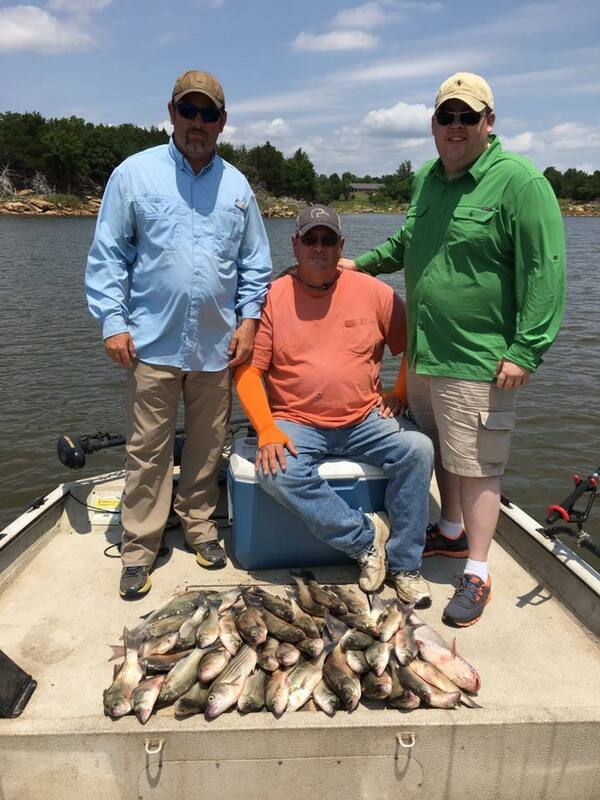 Today, we had first time guests, Tom from New Mexico, on Oologah Lake crappie and white bass fishing. We started the morning out fishing brush piles 10-14ft deep for crappie. Lots of short fish this morning and we only caught a couple of keeper crappie the first couple of piles. I believe it was pile 4 that we finally got on a good bite of good sized crappie. We were using both minnows on a drop shot rig and soft plastic Crappie Kickers from Fle-Fly. Both worked today, but I’d have to give the edge to minnows…especially the dead minnows for the larger crappie. This is typical for mid to late summer crappie on Oologah. Feed them what they want, not what we want to feed them! After the sun got up high and the crappie stopped playing nice, we headed to catch a few white bass to end the day. I believe we got Tom hooked on the slashing hard fighting white bass. He loved catching them and took home a mess of white bass to go along with his crappie. 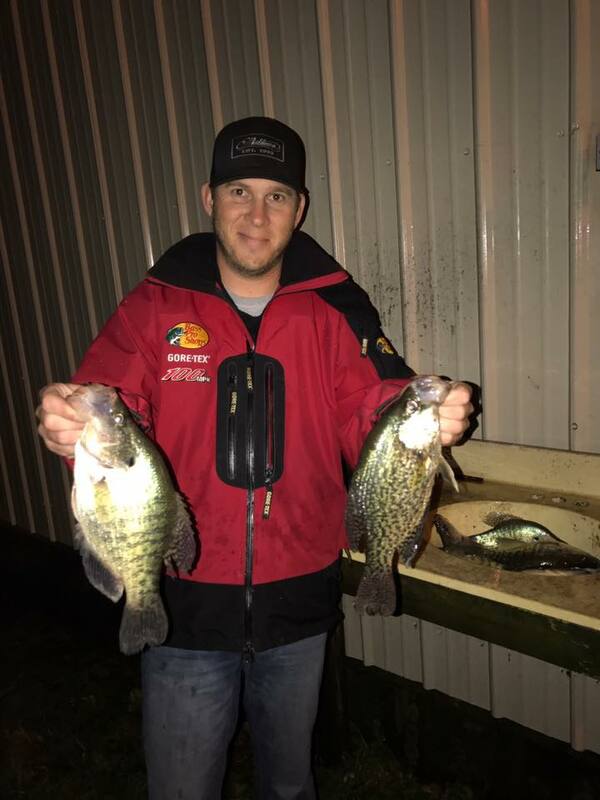 We started out using minnows, but quickly switched to the slab and fly combo catching two at a time and having a blast doing it. White bass fishing is addicting for sure! 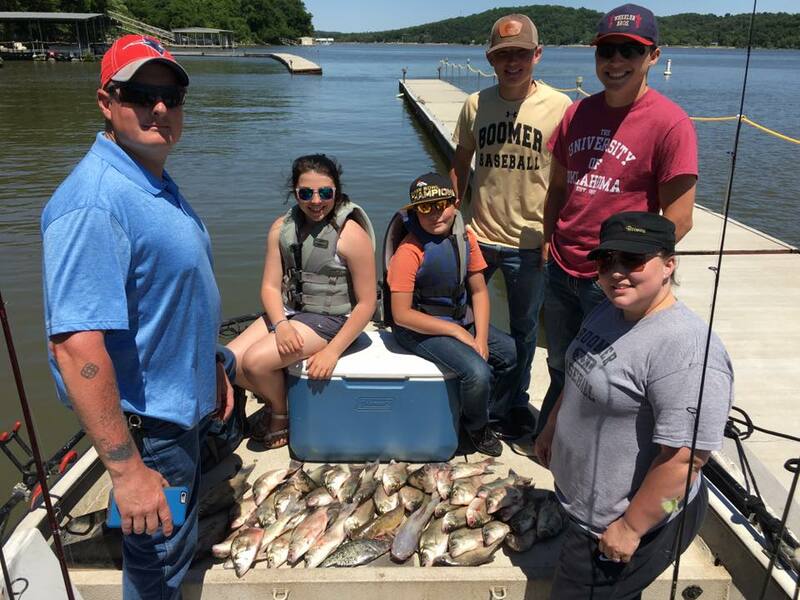 These guys were great to have on Oologah Lake catching both crappie and white bass! I look forward to seeing you guys again this spring. Fishing for Grand Lake blue catfish with good friend and customer Eric. 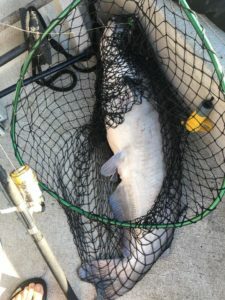 We started out the evening in search of white bass, but after looking at a couple of areas that weren’t holding feeding white bass our sites changed to catfish as we both caught a couple of drum adding them to the cooler. The white bass were suspended out in deep water and we didn’t want to wait on them to come in for their evening feed. So off we went to an area that usually holds good blue catfish. 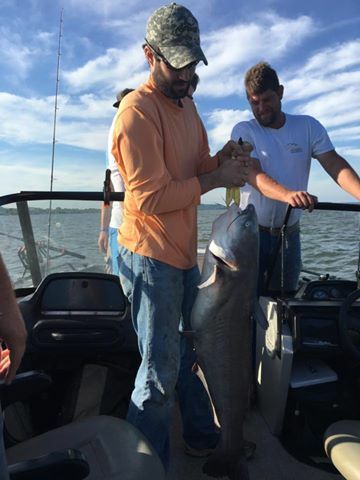 We marked the area and it looked like the blue catfish were holding close to the 25ft mark. We got set up and it didn’t take long to start putting fish in the boat. The bite was aggressive and the rods were slamming even with smaller fish. I believe Eric was getting addicted to the rods slamming to the water! After catching a cooler full of fish I asked Eric if he wanted to make a final drift before the sunset or run back and check on the white bass. Without hesitation he said he wanted to catch more catfish! We rebaited with fresh bait and set up for our final drift in search of Grand Lake blue catfish. I was telling Eric how a big one will sometimes pull the rod down an little, but then the line will go slack as the catfish swims towards the boat. They sometimes continue swimming towards the boat or they usually realize somethings up and take off hard the opposite way. A few minutes later, one of the rods slow pulled down like it had something heavy and then went completely slack. Eric was like a jackrabbit jumping out of the seat and got to the rod just as it slammed down and peeled drag out. He struggled to get it out of the rod hold and once he did the fight was on. This fish had an attitude problem and Eric enjoyed every minute of it. 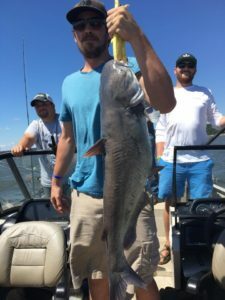 I reeled in all the rods on that side of the boat and got the net back there just in time to get the angry thrashing Grand Lake blue catfish. A few quick pics to show off to his buddies and we revived the trophy to let her grow live to be caught again someday. 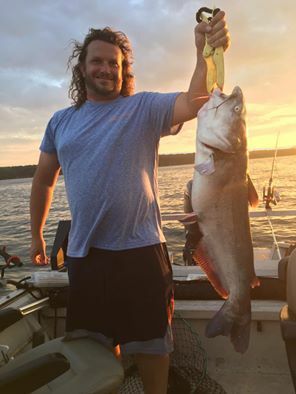 Good times and a beautiful evening on Grand Lake catching blue catfish!!! We had planned on starting the trip at sunrise, but old mother nature had different plans with hard rain and lightning shooting across the sky. A major front was passing that went from the Texas coast all the way up into Nebraska. At about 7:15 while sitting at the boat ramp and the radar looked like it was breaking up just in the area around the lake. We waited a few minutes to make a decision and the updated radar proved to be breaking up just in our area. We got the boat in the water and headed to a couple of shallow points that drop into deep water. We caught a half dozen good white bass, but not the feeding frenzy we were hoping for. So, off to a rock pile and we caught a few more. Then a shallow wind blown rocky ridge catching a few more. Then we made a run to an area that was getting blasted by the wind that had kicked up on the backside of the storm. We found a few surfacing fish, cast out, and all hooked up, but then they disappeared. We had just gotten on plane to head back to our first area when I saw one bird hit the water. The birds didn’t stay, but something told me to go graph the area with the wind blowing into it. I marked a few fish and decided to drop the trolling motor and not disturb the fish if they were on this really shallow sandy point. I told the group that I would make a few casts and see if it was worth fishing. First cast and I never got the bail flipped before I was doubled up. I got the MinnKota remote, hit anchor lock, and we managed to boat fish after fish for a couple of hours. 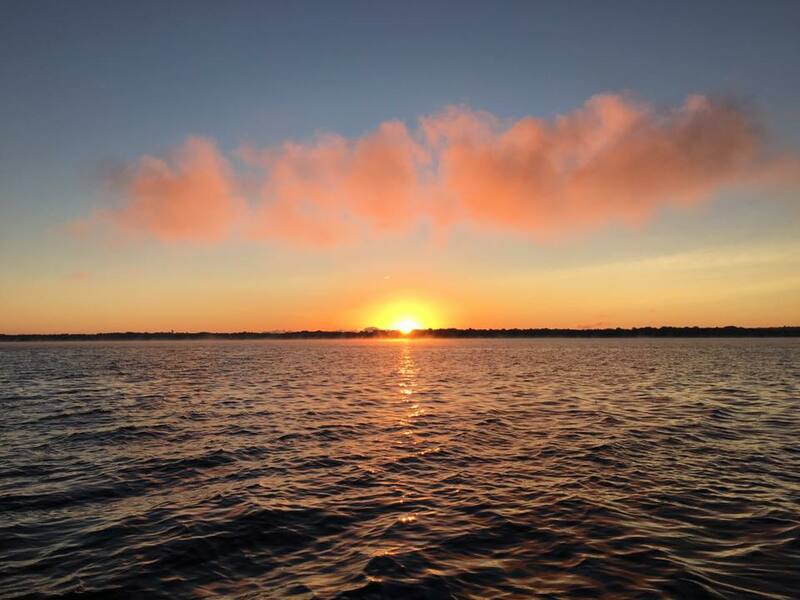 The stars aligned and it turned into one of those magical days on the water. I’m pretty sure we surpassed the 200 fish mark with them keeping about 40 for their grandparents a fish fry. 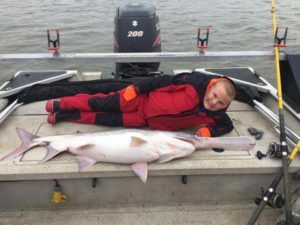 The nine year old boy is not ruined and fishing will never be the same for him. His ear to ear smile and laughter as lost track of how many doubles he caught in a row. Good times catching Fort Gibson Lake white bass with new friends from North Dakota and Kansas! I had the pleasure of taking out the Reavis guys on Keystone Lake this morning. 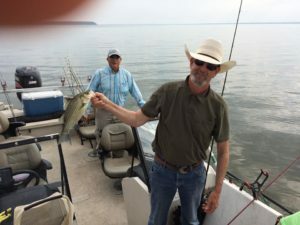 The action was fast and furious for the first hour and a half and then flat lined with the fish vanishing despite our efforts to find their new location…typical full moon bite unfortunately. 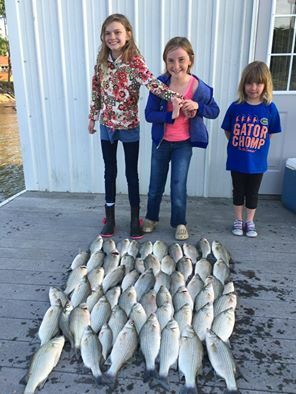 We managed a nice mess of white bass, striper, and blue catfish for them a family dinner. It was good to see you guys and catch up. 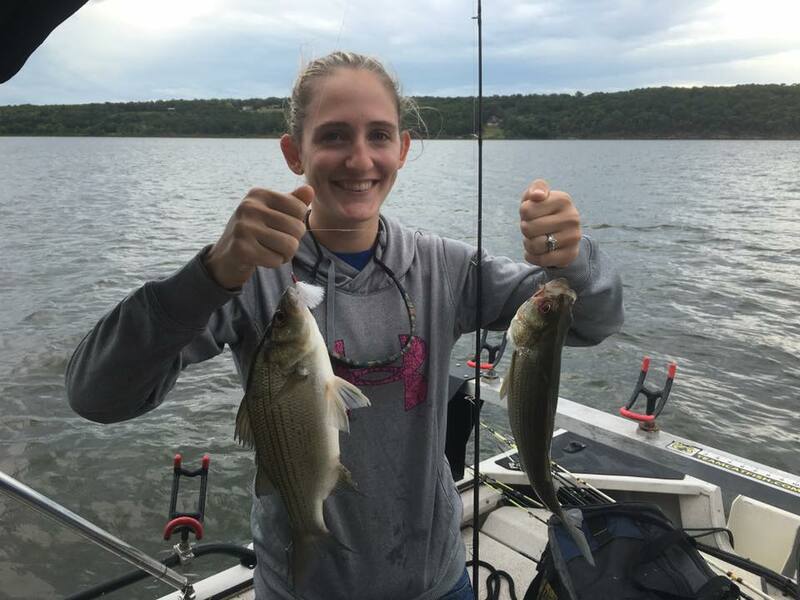 Striper were caught on downlines in 20-26ft of water and white bass were caught on slabs and fly combo’s in 10-18ft of water. 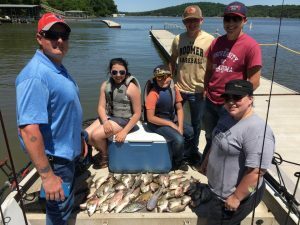 The white bass are back from the spawn and on their annual feeding on Grand Lake in Oklahoma. 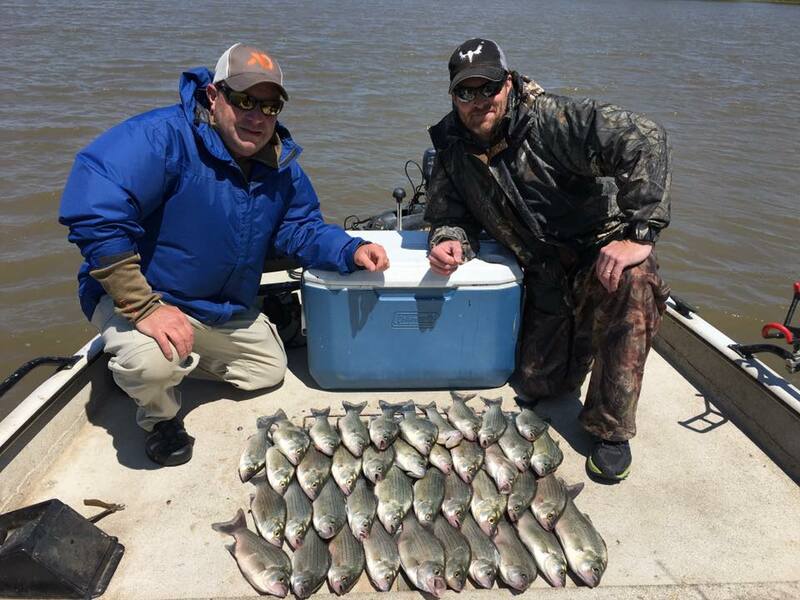 Friday morning, I loaded up the boat with Chris Day and his family for a morning of catching white bass and crappie. The white bass were in a feeding frenzy right off the bat and we filled the cooler! They were catching them as fast as I could take their fish off and get them in the cooler. The feeding frenzy lasted for about an hour and then the bite slowly trickled off. We caught them on a point in 8-14ft of water on slabs and flies. Color didn’t seem to matter one bit. Next, we decided to see if any crappie were feeding in a few brush piles. We checked 2 and nothing showed up on the graph. Our third pile showed a few hanging out and we got two bites, catching one good keeper. 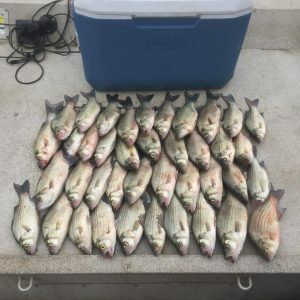 We checked several other piles and didn’t really find what we were looking for so we went back and caught a few more white bass before calling it a day. Great day on the water and some kids are now hooked on fishing. Saturday morning, I had the pleasure of having David Pease’s son and son in law for a morning catching white bass on Grand Lake. Wow, the weather drastically cooled off and it was a tad chilly this morning. Our first stop only produced a few fish. The graph was full of fish, but they just wouldn’t stay active and feed the way we wanted them to. Off to a different area and we found a great school that was more then willing to feed. We filled their limits in a hurry and caught and released many more. Fun times with a great group of guys on Grand Lake! After cleaning fish and a pit stop to eat lunch with my wife and kids, I went and picked up Eric and his three girls. The goal was to get them hooked on fishing…goal achieved. 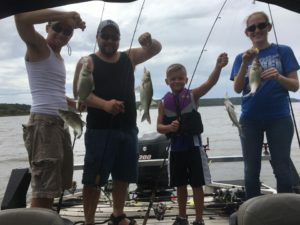 They weren’t to sure about going fishing, but a couple of hours into it and they were asking when we could do this again making for a happy dad and happy fishing guide. They reeled in every single fish while laughing and giggling. It’s always a treat to get youngsters making positive memories in our great outdoors. 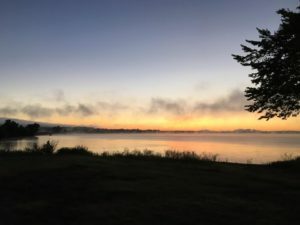 I took Sunday morning off to get things cleaned up around the cabin and spend some much needed time with my wife and kids. Monday morning, I woke up to pouring down rain and high winds. 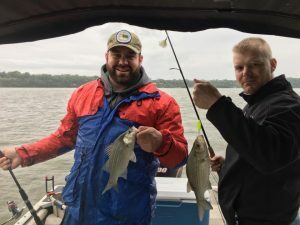 A group of veterans from The Fallen Outdoors were on their way for a morning of catching white bass on Grand Lake and the weather was not looking good. I suggested we wait an hour and see what the weather looks like at that point. Well, it didn’t look like anything was going to change, so I ran out and put up the top and got the rain suits out. We were able to stay fairly dry and have a blast catching Grand Lake white bass with the top up. It was an honor donate a trip to take out these veterans and share a great morning of catching. I look forward to our next trip guys! All white bass were caught on slabs and flies/jigs. White, chartreuse, silver, it just didn’t really seem to matter. 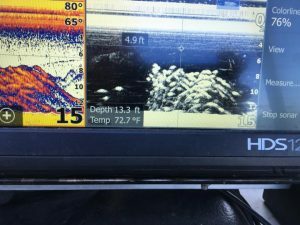 We caught fish in 3 completely different areas each day using the Lowrance to locate big schools of feeding white bass. I only saw a couple bust the surface, but the real frenzy was under the surface. Grand Lake white bass action is busting wide open and the frenzy will continue as long as our water stays clear.